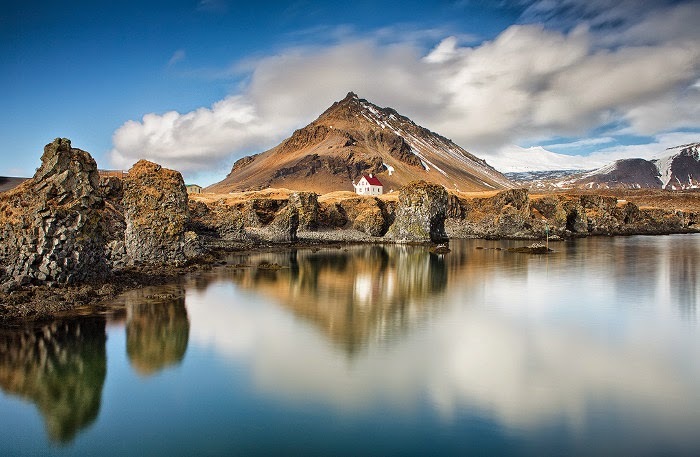 If you’re planning to tour Iceland by car, then Iceland car rentals provide the cheapest and best way to explore the vast island. 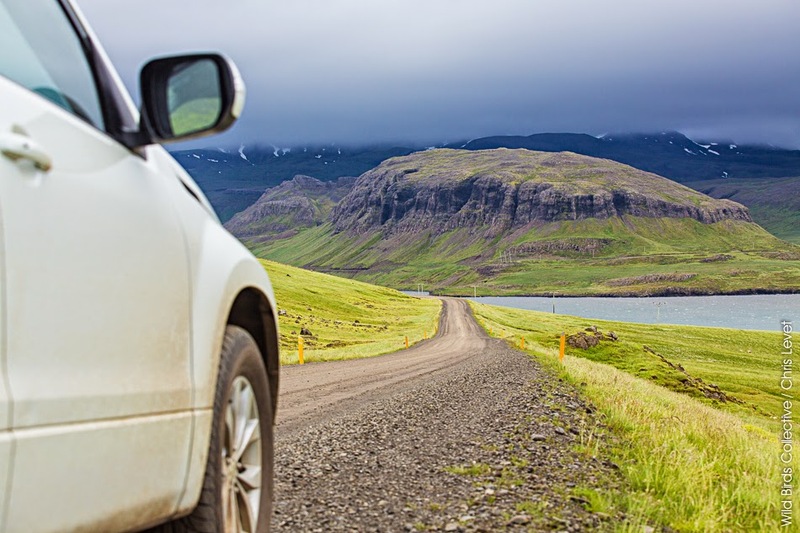 With public transportation being scarce outside major cities like Reykjavik, renting a car becomes the cheaper and most viable option for tourists to explore the island fully. Though it may seem expensive initially, it is much cheaper and less strenuous than having to purchase a car or travel by bus. With plenty of car rental companies in Iceland at your disposal, you will never fail to get a deal that suits your budget. 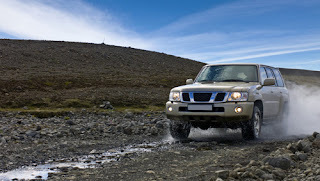 The wide array of vehicles available for hire also makes it possible for you to get a car that can take you almost anywhere on the island from SUVs, four wheel cars, luxury cars, 4×4 rental cars and jeeps just to mention a few. 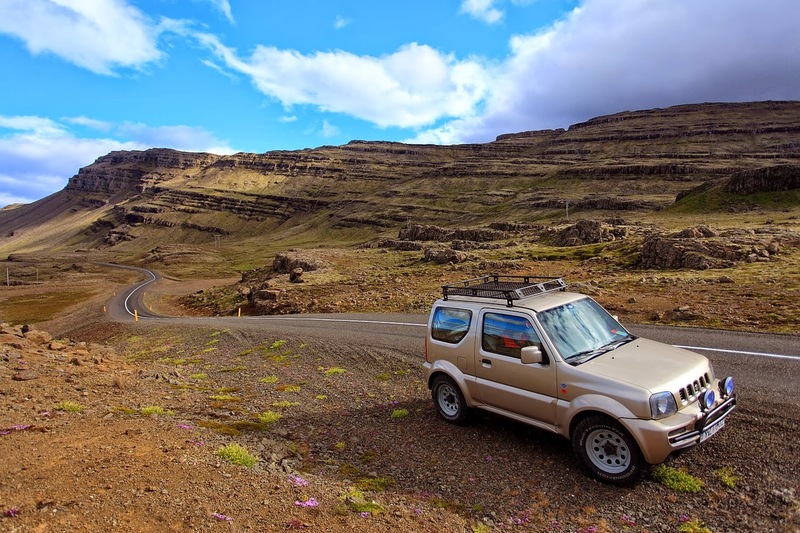 In this article, we give you some tips on picking an Iceland car rental provider as well as taking a look at some of the best car rental companies on the island. Renting a car is really the best and only way to see the country so be sure to factor it into your budget. We went there thinking we would just take a bus to other areas -wrong. The only buses that exists outside the capital city of Reykjavik are tour buses. So technically you can take a bus but you will pay for it because it will be part of an organized tours and it will add up fast. If you are traveling with another person a car is the cheapest way to see the country. 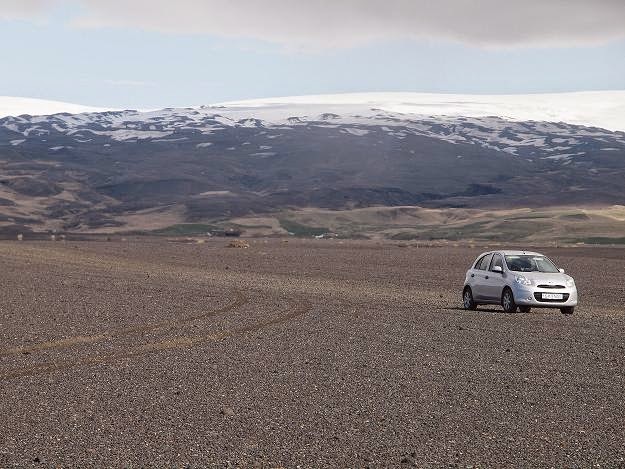 Plus, driving in Iceland is very easy and there isn’t much traffic. 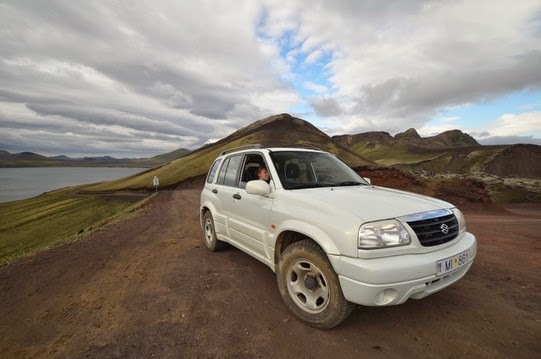 Renting a car in Iceland may not be the cheapest way to explore Iceland (it’s tough to beat hitch hiking) but it doesn’t have to blow your budget. With public transportation being non-existent outside of the larger cities, like Reykjavik, renting a car gives you the freedom at a fraction of the cost when compared to the sightseeing tours sold at tourist information centers. Don’t buy it: You don’t need theft insurance for the vehicle. 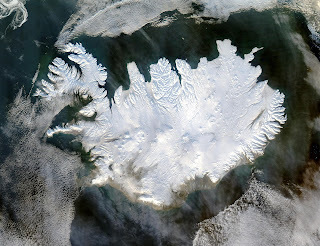 According to our agent, car thefts in Iceland are rare and he actually told us not to bother with any of the additional insurance (yes, they have insurance for ash from the volcano) either, so we didn’t. 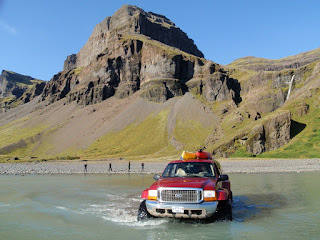 Go online: The best deals can be found online for Iceland car rentals. By booking online, you will find a better deal than renting directly from a tourist center in Iceland. Some online companies even offer discounts if you book online therefore you will be able to save a lot by booking online. There are a variety of car rental companies on the island so take your time and visit their websites, compare prices, and look at their packages and whether or not they offer discounts for booking online. By doing this, you will be able to get a good deal at a pocket friendly price. Pick up at Keflavik International Airport: Because the airport is located about an hour from Reykjavik, you will have to spend €15 – €20 each way to get to and from the airport. So, you might as well just rent your car from the airport and roll your shuttle bus fees into the car rental. Get to know your vehicle: The longer you keep the rental car the cheaper it becomes. Petrol Blues: When considering renting a car be sure to factor in the cost of gas. In Europe, petrol is sold by the liter not the gallon; therefore, expect to pay about $5 per gallon. 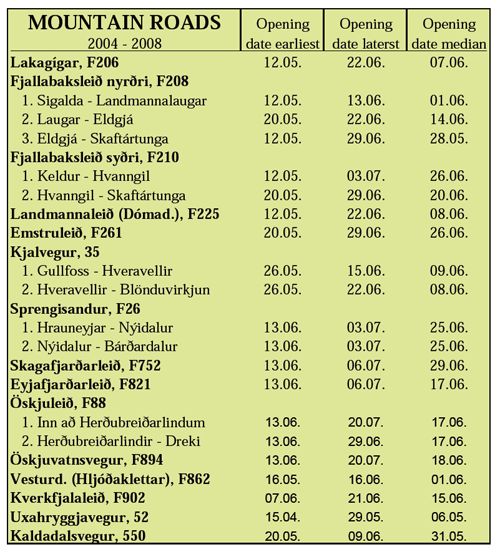 Choose Your Rental Dates Wisely: Sept. 1 in Iceland signals the beginning of the low season, which runs until May 31. 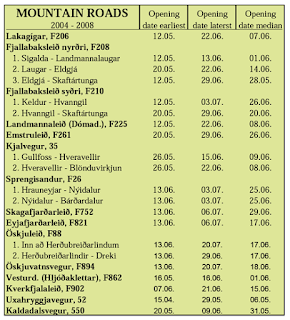 Renting a car in Iceland becomes even cheaper during that time. And by cheaper I mean €35/day vs. €85/day – it’s a HUGE price difference. Consider your budget: Look for a car rental company that falls within your budget. Remember you do not have to spend a fortune on car rental therefore try to get a car rental service that will leave you with some cash to spend on the road. Driving Conditions in Iceland are in many ways unusual and often quite unlike what foreign drivers are accustomed to. It is therefore very important to find out how to drive in this country. We know that the landscapes are beautiful, which naturally draws the driver’s attention away from the road. But in order to reach your destination safely, you must keep your full attention on driving. -The speed limit in populated areas is usually 50 km/hr. -The speed limit is often 60 km/hr on thruways, but in residential areas it is usually only 30 km/hr. -The main rule in rural areas is that gravel roads have a speed limit of 80 km/hr, and paved roads 90 km/hr. 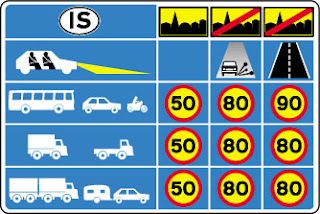 -Signs indicate if other speed limits apply. 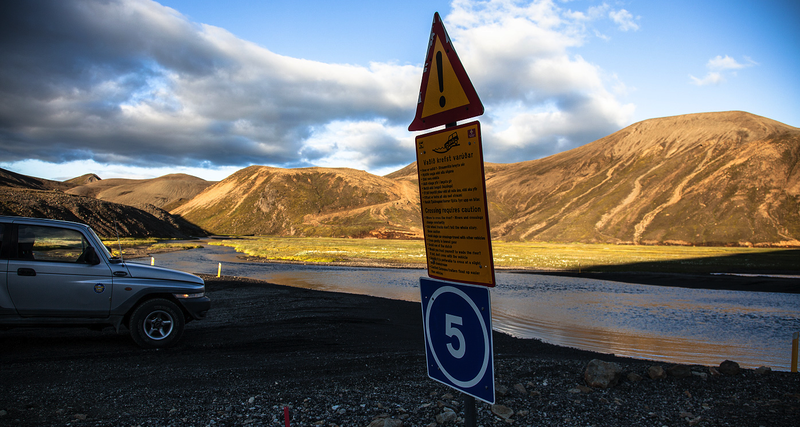 Driving in the Icelandic highland is quite different from driving in the lowland. The conditions can change fast due to weather, rain and even sometimes snow. Therefore roads can be closed and rivers can be too big to cross. Before you start your travel you should get information about the area as well as leave your travel plan with someone who can check up on you if needed. -Are you sure that you have the experience and knowledge needed to go the highland? When the fact that the country lies right below the Arctic Circle is taken into consideration, along with the fact that the growing season is short, it is apparent that the environment can take many years, decades or even centuries to recover. For example, many people don't realise that by uprooting or driving on moss, damage is caused that can take at least a decade or, more likely, some hundreds of years to mend – and we're not even talking about the highlands where the summer is much shorter. Whilst travelling around the country, the highest respect for the Icelandic environment must be shown. It's good to remember to take nothing besides photographs and leave nothing behind except footprints. -Check out the road map and see where the roads and trails are. -Get information about the appropriate routes at visitor centres, and from rangers or staff. -Find out in advance when mountain roads are likely to be open, along with other related information, at visitor centres or here. While on your trip around the country you’ll quickly see that in many places, road ruts and paths have formed from other people. Often they are closed off with nothing more than a row of small rocks. Don’t be caught in the pitfall of following those paths; only stay on roads and marked trails. Instead, think about the damage off-road driving has caused, take photos and educate friends and acquaintances. See how long such damage takes to heal. Notice that ruts don’t just look ugly; they draw in water and thereby cause even further damage, leading to erosion of soil and vegetation. Walk around a short distance or turn around if you can’t go any farther by driving. That’s the only right thing do. Besides, you can easily expect a sky-high fine or prison term for offences. We should all set a good example. Together we share the responsibility of ensuring that everyone gets the chance of enjoying a pristine natural environment for years to come. -Rivers often have less volume earlier in the day, so organising hiking trips accordingly is not a bad idea. -Look around for suitable locations to ford. Be aware that places that are good for crossing with jeeps are seldom good for crossing on foot. -Look for meanders in the river which are places where there is loose gravel and sand and the current dies down as the river expands. -Meanders are usually the best location you’ll find for fording a river though the river may be wider there. -Preferably wade the river with two or three other people at a time by clasping arms together at the elbows. -Loosen any straps on backpacks and be sure not to have anything tied tight that could complicate things if you or someone else might fall. -It’s best to have special wading shoes as it is not wise to cross barefoot - this can increase the likelihood of a fall. -Before fording, it’s smart to decide on a spot farther down the river where everyone will go to if someone might unfortunately fall. -If you fall, roll onto your back, keep your feet in front of you and trudge to the place - or near to it - that was previously decided upon. When planning your hiking trip get information about rivers, if they are possible to cross on foot and then what time is best and etc. Never cross a river unless you are 100% sure of how to do it and feel safe doing it. 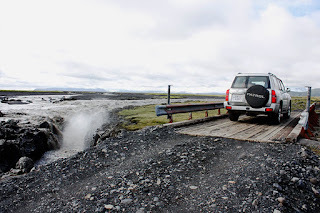 If you have plans to visit Iceland's country side then you should also pick a 4x4 vehicle since you will most likely be driving on some gravel roads. 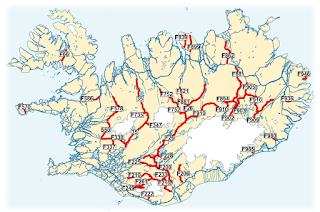 And should you go off the beaten path to visit the Iceland highland then you are sure to encounter some F-roads that are only driveble by larger 4x4. Iceland gravel roadsAll major roads in Iceland are paved. 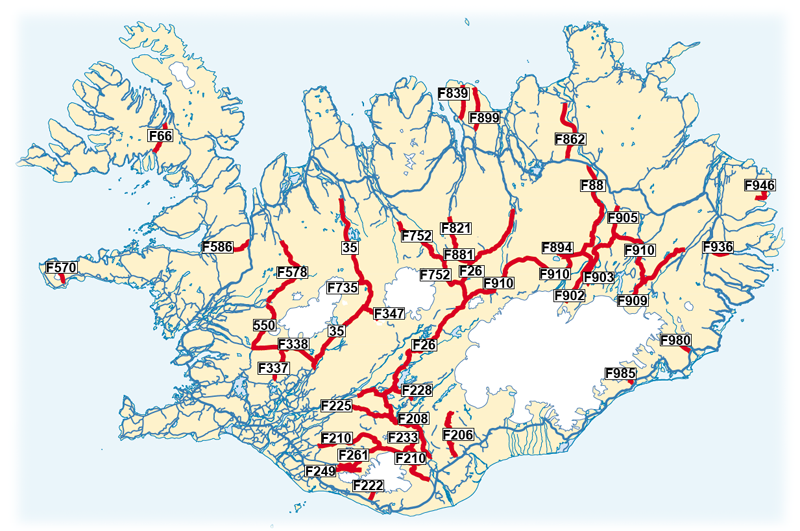 But keep in mind that of 13.000 km total roads in Iceland only about 5.000 is paved with asfalt. 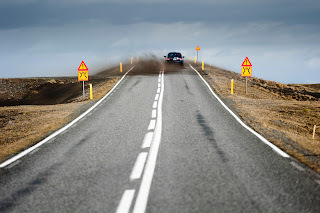 Most gravel roads are not difficult to drive on or dangerous, you just need to keep special attention while driving and make sure you are not going to fast. These roads are often narrow and many bridges only have one lane. You are also likely to meet some sheeps and Icelandic horses so make sure you are paying attention. Make sure you are always driving according to road and weather conditions. If there is snow and the roads are slippery make sure to take it slow and drive safe. If you are driving outsite of populated areas make sure to find out the conditions of the roads on your route. You should also check out the weather forecast. Information on the approximate opening date of the principal mountain roads is given in the table; the map below shows the locations of mountain roads. The first two columns of the table show the earliest and latest opening dates of the roads over the past years. The third column shows the average date of opening during this period. The road may not, in practice, be opened on the projected date, as the question whether a road has become passable is subject to weather conditions and the amount of snow in the highlands. More detailed information on the opening of highland roads can be found in maps issued by the Public Roads Administration and the Environmental and Food Agency during the spring and early summer, and published in the press. Nice blog, content is too good. Amazing info of car rental price..
Just returned from a 10 day trip from Iceland and rented a car from Cars Iceland (http://www.carsiceland.com). I was quite happy with their service as they dropped off the car to our hotel for no extra charge and made arrangements to pick up from the airport also. The communication was great as they were able to e-mail details back and forth as needed. I checked many different sites and Cars Iceland had the best pricing. I would surely rent from them again. Thank you so much for this amazing blog. I was wondering where do i get a best travel guides for my next tour. From here i get many things.